Mendon Ponds Park is the largest park in Monroe County, sculpted by glaciers and covering 2,500 acres of woodlands, ponds, wetlands and many small rolling hills. Trails throughout the park are well-maintained and offer some pleasant views for hikers. The ponds are open to those with an interest in canoeing or kayaking, but unfortunately closed to swimmers. During the winter months the park is an excellent destination for cross-country skiers. If there is sufficient snow, Mendon Ponds is the Mecca for Rochester area cross country skiers. Trail grooming is provided by a combination of Monroe County and the Rochester Nordic Ski Foundation ( http://www.xcrochester.com ). Pavilions and lodges for rental are available throughout the park. There are wide variety of trails from those with very gradual changes in elevation near the Nature Center or around Quaker Pond to the more challenging trails along the east and west eskers. With its many entrances and exits, the park would be almost impossible to effectively close after hours. On any clear summer night you're likely to find rogue savages wandering the park. 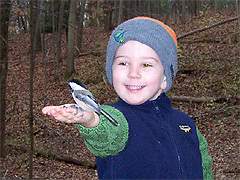 In the winter months, it's fun to go on the trails by the Nature Center (with a bag of birdseed) and feed the chickadees and nuthatches right from your hands. The nature center is also home to Wild Wings which cares for injured birds of prey. They also rent snowshoes in the winter and have a small shop that stocks sunflower seeds to feed the chickadees. In the summer, Sharon’s Sensory Garden and the butterfly and humming bird garden, next to the Nature Center, have a diverse selection of plants, highlighting color, texture, fragrances, and form.